1) Charitable Adult Rides & Services: to donate a car, pickup truck, motorcycle, scooter, or ATV, go online to careasy.org or call toll-free 844-KGNU-CAR (844-546-8227). Cars and trucks can be running or not; motorcycles, scooters, and ATVs need to be in working condition. We accept boats and RVs, as well. 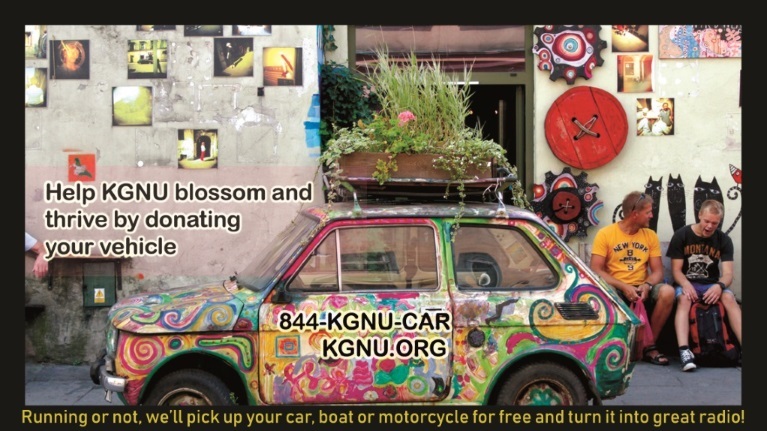 Call 844-KGNU-CAR to make donations of this type. Either organization handles the sale, with proceeds minus the expenses going to KGNU. The entire sale of the vehicle is tax deductible and the organization will provide the tax receipt for you. We will take cars and trucks that run or not; some restrictions do apply. They will tow cars and trucks that do not run, with no additional charge to you. You must be able to provide the title to the vehicle.